Dune High Heel Sling Back Shoes Gold Size UK 5. Generally in good condition, only slight change to the quality of the colour on right shoe. I have tried to capture this in the second photo but it is difficult to show. It is visible to the naked eye if you hold the shoe in eyeline. The low buy it now price is reflective of this. On the foot it is barely noticeable, especially if wearing them on an evening. 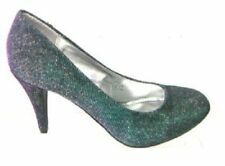 These are certainly going out shoes to add a touch of sparkle to an outfit. Dispatched with Royal Mail 2nd Class. Size UK 2 - EU 35. 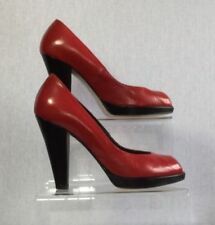 Kurt Geiger, (HETTY) Fabric/Leather, High Heeled, Evening Shoes.